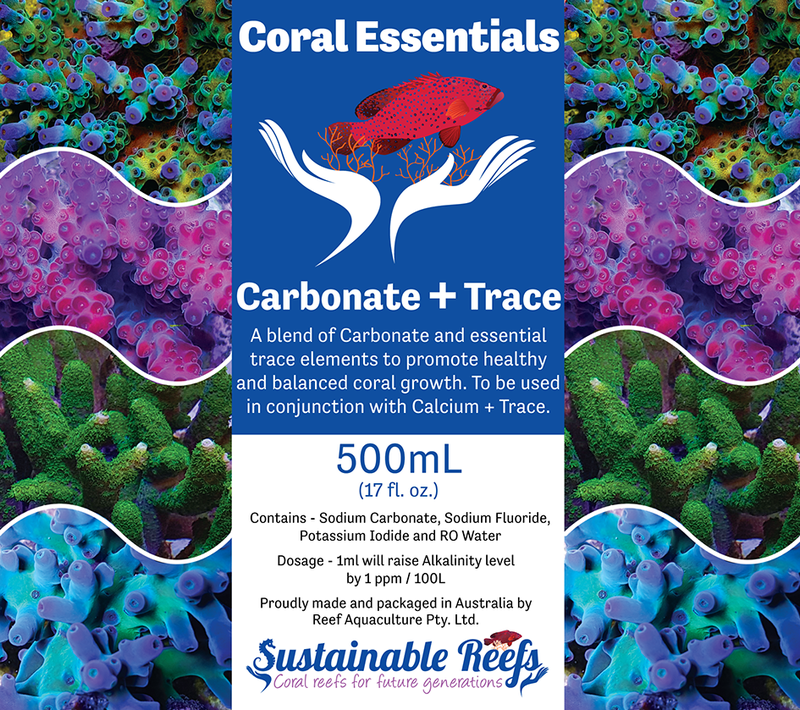 Our Coral Essentials, Carbonate + Trace is a concentrated source of liquid carbonate, 100,000 ppm (mg/L) or 5,600dKH and our own unique blend of trace elements. We have added our Coral Power Trace C elements into this mix using our proven Coral Essentials Method dosing regiment. When using Carbonate + Trace there is no need to add additional trace elements unless you have a SPS dominant system. It is primarily blended for a medium density SPS system so aquarists with high SPS density tanks may wish to add additional Coral Power Trace C into this solution at the rate required. Start with an additional 0.25ml of each Trace C and see the results, increase from there as required. The alkalinity (KH) levels in marine tanks need to be checked regularly to determine the take up in your system. Simply calculate dosing requirements to suit the depletion rate. After you have determined this, a regular check of the alkalinity levels should be made. Your tank will change over time as coral grows, new pieces are added as well as invertebrates that also take up carbonate. We have found ideal KH levels to be at about 8-9 dKH for most aquariums. Levels of 8.5 – 9.0 dKH are desirable if you want to maintain high levels of growth in a SPS and hard coral dominant system.